Need EARLY CHECK-IN? Just inquire (often available as early as noon). 1. Nothing but 5 Stars* across all vacation site platforms (See photos and reviews on this site and others). 2. This is a custom-built, cozy, and elegant 1400 sq ft lodge-style cottage villa. 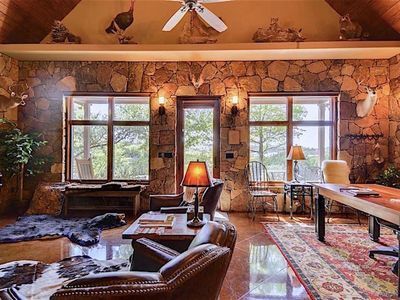 Located on a nearly 20 acre private Austin - Lakeway estate, the property is graced with native wildlife, seasonal flowers, bluebonnets, and songbirds. 3. Guest access is via private entry onto exclusive estate drives (paved and gravel) with gorgeous views, marvelous stone landscaping, native wildlife, and periodically grazing show horses. 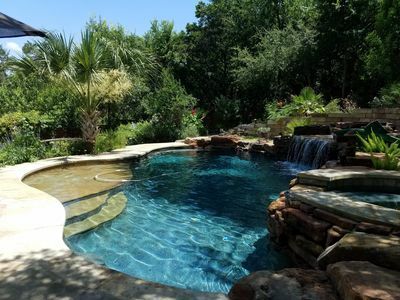 After daily activities in the surrounding Lakeway - Austin area, this property offers a return to privacy, open spaces, scenic views, quiet walks, and natural surroundings. Guests enjoy exclusive use of the guest villa for the duration of their stay. 4. The villa home interior is custom-furnished, with magnificent polished flooring, fully equipped kitchen, separate living, separate bedroom, king size bed, large elegant bathroom, and a grand loft above. 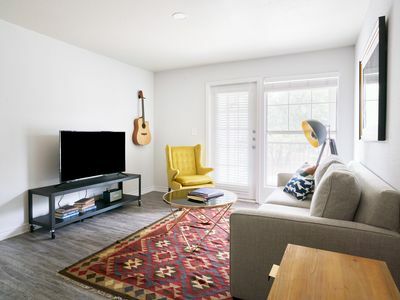 A sofa loveseat, antique gas iron fireplace, and leather seating adorn the lower level living, and are accompanied by well-arranged tables, desks, & chairs (above and below) that double as excellent workstations for longer term and business stays. 5. Constructed in 2011 for owner guests, the mountain-style villa is private, scenic and fully tech equipped. 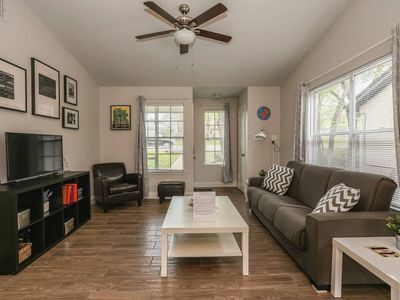 All utilities (A/C, heat, water, etc), amenities, towels, bedding, cooking utensils, dish-ware, appliances, high-speed WIFI, Blu-ray, Cable, HDTV, & Washer/Dryer are included. 6. 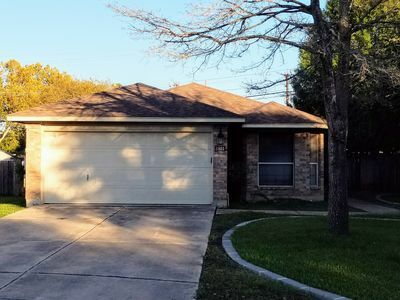 The property is spacious, safe and peaceful, yet close to everything from Austin-Lakeway fine dining, entertainment, groceries, and shopping to Lake Travis water recreation, golf courses, wineries, spas, and health facilities. 7. 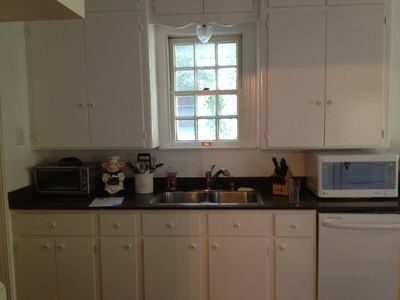 Last, but not least, the cottage villa is immaculately cleaned and prepared for each guest. All stays are private and limited to 2 adults at a time. 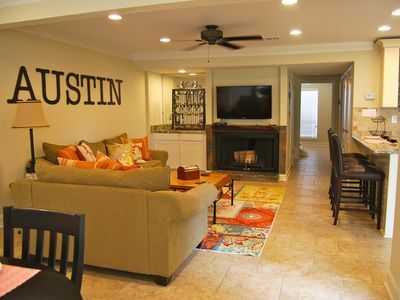 Balanced perfectly for couples, this property not only offers a large, beautiful, private retreat, but also serves as an excellent location base to explore Lakeway, Austin, and the surrounding Texas Hill & Wine country. It is well-suited to short or long-term stays, for anniversary trips, weekend escapes, local exploration and tours, or to visit area family and friends. The property also attracts business travelers, engineers, scientists, writers, artists and medical professionals on assignment. 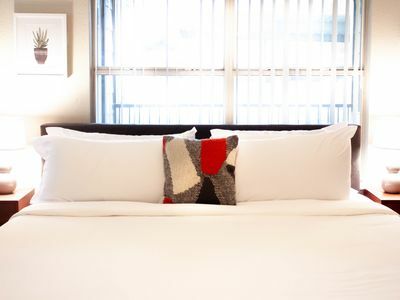 Based on guest reviews, it is the property's beauty, quiet, and spacious privacy that gets the most appreciation. 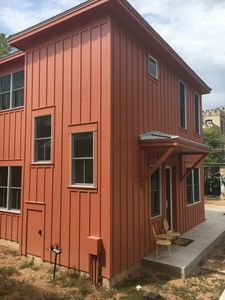 Additional high marks are given for active bird and wildlife observation (from the comfortable interior, front porch, and other places on the property), watching the onset of sparkling high-country sunsets, then gazing up at starry nights, enjoying patio rockers, breezes, conversation and panoramic views (with a morning cup of coffee or an evening glass of wine, of course), taking quiet walks on the property's private drives, or climbing the gentle path to the adjoining cliff-top patio to scan the horizon. 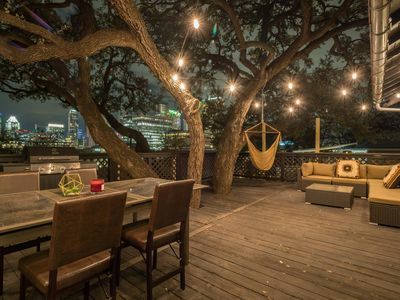 Beyond the property, there is sight-seeing, hiking, dining out, shopping, wineries, craft beer, BarBQ excursions, golf, music and concerts, exploring Austin (history, museums, State Capital, UT, Congress and 6th Street, etc). 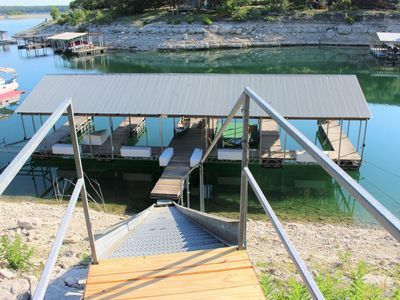 Many guests enjoy the area spas and abundant Lake Travis water activities. Boating, jet-skiing, water-skiing, fishing, paddle boarding, sailing, etc are all available close by and accessible via the Lakeway Marina, a short 4.5 miles away. 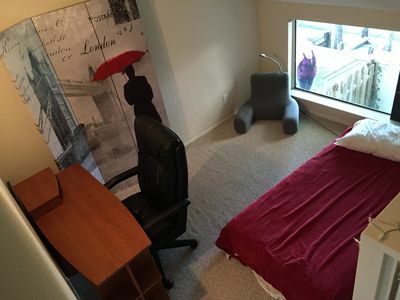 Perhaps the best thing about this property is that it is not remotely located. In fact, it is actually right in the midst of some of the best dining, shopping, entertainment, music, recreation, lake, and leisure activities in the state (many under 5 minutes away). After entering the main gate, the guest villa is easily accessed via winding estate drives, over wet/dry pond and creek, through fields and trees, then up a hillside with scenic views, private guest parking, and outdoor hand-crafted stone walls and landscaping. 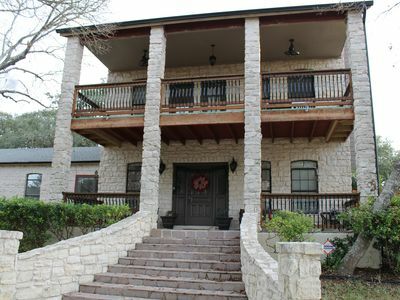 The guest villa offers visitors a vintage storybook Texas hill country feel (peaceful, independent and cozy), combined with wonderful interior lodge-style Hill Country wildlife and mountain decor. Upon entering the cottage villa, guests are greeted by an exquisite large main living area with high-gloss floors, stonework & area rugs, an antique-style gas iron fireplace (with instant "on-off" and operational 11/30 - 3/1), comfortable leather seating, separate sofa love seat, beautiful high pine wood ceilings, and furs placed all around. The view and scenery back west through the panoramic windows is inspiring, peaceful and relaxing. Close-by feeders offer observation of area wildlife, birds and hummingbirds from the comfortable interior. 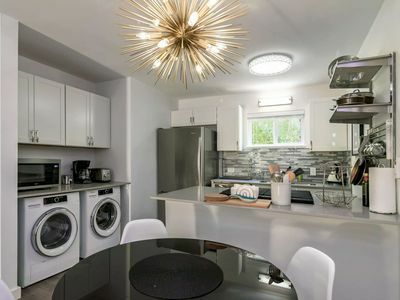 A granite full kitchen, large custom bathroom (with king-sized walk-in decorative tile shower, 2 separate shower heads, & seating), and cozy private bedroom add to the relaxed, spacious feel and smartly designed charm of the place. The decorated stairway, artwork and 2nd floor grand loft above--which overlooks the main living area below--allow for even more space to explore and enjoy. The loft boasts a large 6-person table for dining, work or small gatherings. The mountain-style villa is outfitted with a Main Room 55' wall-mounted LED Cable HDTV, bathroom Cable TV flatscreen, free high-speed WIFI throughout (allowing use of a tablet or laptop for bedroom reading or personal TV), and convenient workspaces on 2 levels - all of which allow guests to easily check-in with the world, home, and office without missing a beat. This is the perfect spot for weekend TV sport watchers also. Rolling pastures and trees, distant views, white rail fences, a one-of-a-kind working stone barn (and more) grace the larger property now devoted to native land preservation and private wildlife enhancement balanced with small footprints of organic agriculture and seasonal quarter-horses. Longer term guests or those with day-trip opportunities often venture further west into the Hill Country for wildflower observation and tours of the more remote towns, villages, quaint shops and wineries - returning each evening to the guest villa with great discoveries, plenty of stories, and fascinating historical data and Texas folklore. 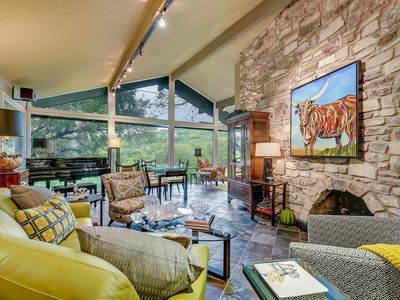 The property is only 4.5 miles from Lake Travis, 3.5 miles from the Lakeway Airpark and 25 miles from Austin Bergstrom International Airport. The Lakeway Marina is 4.5 miles away (boats and jet skis can be rented by the hour) and lake activities are enjoyed year-round. Golf courses (including Falcon Head, Flintrock Falls, Yaupon and The Hills), as well as the World of Tennis facility, are all within 5 miles (check with each to determine eligibility). The new Lakeway Regional Medical center is 5 minutes away (out of sight, but there if you need it). Groceries, dining and shopping are within 2 miles, and the Hill Country Galleria and Whole Foods are within 4 miles. 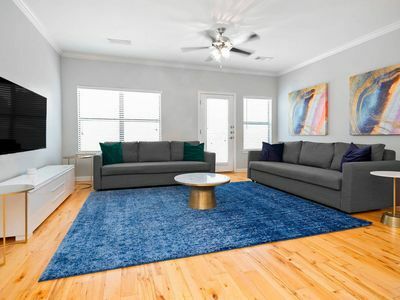 Downtown Austin, Zilker Botanical Gardens, The University of Texas, Lady Bird Johnson Wildflower Center, and the Texas State Capitol complex are all within 15-20 miles. 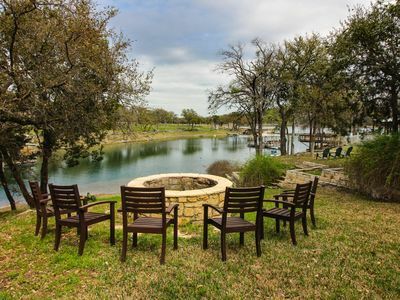 Day trips to Fredericksburg (1½ hours away), Marble Falls, Johnson City and the LBJ Ranch, Wimberley, and New Braunfels afford great opportunities to explore the wider Texas Hill Country from this Lakeway base. With a confirmed booking, each guest is emailed an excellent summary of owner-suggested Area Dining, Entertainment and Adventures to help plan and enjoy the stay. For water-minded guests, Lake Travis, the Lakeway Marina and the Lakeway resort pools are close (4.5 miles), the water is clean, and the views are wonderful. Lake access is usually free (or the charge is nominal). Lake activity options (boating, jet-skiing, sailing, fishing, etc) are endless. Watercraft rentals are available by the hour with easy reservation procedures. Access to the Lakeway resort pools (with poolside food, bar, etc) is usually secured with the purchase of a short massage or spa treatment there. Last, but not least, our beautiful area springs (Krause Springs, Hamilton Pool, and Barton Springs) are literal oasis's, presenting yet another incredible water recreation opportunity. Considering these (via google search), contacting and taking advantage of them will deliver the best of both private estate villa and water recreation to interested guests. No home pool could ever compare, and the villa property does not maintain one. The owners love PETS. However, for various reasons (including pet safety, allergy concerns of other guests, and compatibility issues with existing animals and property wildlife), guest PETS are not permitted. Additional visitors beyond the 2 booked occupants are not permitted without advance notice & owner approval. Beyond the 2 booked occupants, no additional persons may sleep over. No parties are permitted. The property is scenic and beautiful, but largely landscaped and maintained in a natural state. Changing seasons, short and long-term weather patterns and events (heat, cold, rain, drought, flood, etc) will affect appearance, conditions on the property and in surrounding areas. NOTE: Texas’ climate includes regular periods of drought. All utilities, especially water, must be used wisely and conservatively to preserve area resources and protect our aquifers. A standard release and indemnity agreement is required of all guests upon arrival. Thanks for visiting this website. We hope to welcome you to a wonderful stay at the cottage villa! 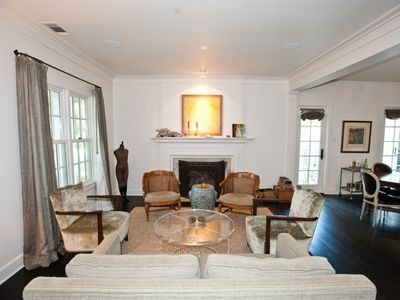 Beautiful Tarrytown Home! 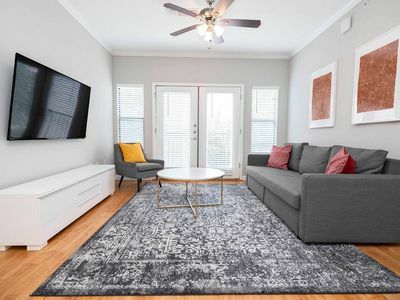 Quiet Elegance Minutes to Downtown! Beautiful home with custom pool near popular nightlife area. Garcon - walk to downtown!! Dog-friendly waterfront cottage with private deck, views to die for and just steps from the water!